That is wishful thinking. Expect the SLS 2B to be more expensive than the SLS 1B, IMO. Also to get to the SLS 2B you need to restart RS-25 production and developed some flavor of advance booster. The advance booster is iffy considering the past with the STS's booster history. And your table shows how noncompetitive the SLS is for assembling vehicle stacks in LEO in price. Of course the SLS will have a bigger payload fairing. You are correct in that historically NASA costs have increased as the LV capability was expanded. But there is always hope that they would also do cost reduction work at the same time as creating a new version. In the end LV selection could be just payload faring volume, cost being a secondary consideration. Bulky items SLS. 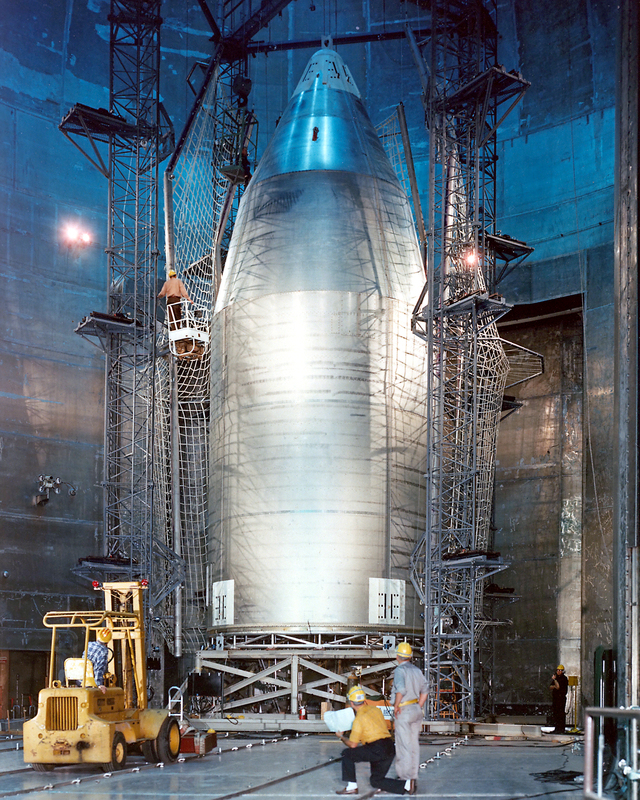 Compact items commercial, such as propellant stages. At the Space Power Facility in Plum Brook Station, Ohio. The largest vacuum chamber there is 30 meters in diameter and 37 meters tall. Live test on a commercial launcher with an adapter. After all the Atlas V got that 7.2 meter fairing option. In which case I hope the dummy payload comes with telemetry so the engineers any problems the fairing has opening. I guess its once again time for my quarterly reminder that should SLS fly, or fly more than a couple-four times, the ultimate variation we'll see is 1B. Having said that, I fully support SLS, and I bet the refined 1B will throw N. of 111T. Oh, I know Plum Brook well. I've been inside it before. But even testing the 5m commercial fairings is cramped, let alone a much taller and wider 10m fairing. I'd argue there isn't enough room for a 10m by 30m fairing to be fully tested inside the space, since it needs room to actually separate, with all the mechanisms involved. Heck, the doors are only 15m square. I don't see it realistically and fully being tested at Plum Brook, and I've never seen this realistically addressed. 10m fairings are a nightmare and likely to cost a fortune. How do you even transport them? Build them? Test them? 8.4m fairing even is a stretch (though isn't as absurd as 10m). My bet is SLS will fly only with Orion or the 5m fairing before being cancelled. Well of course if you ignore costs every capability looks great. Unfortunately there IS a cost associated with each capability, and that will influence whether that capability is ever used. @Scotty disagree with you on the Clarification on SLS Block 1B Capabilities thread on the 111T+ guess. Presuming you meant metric tons. Orion won't come with the same fixed costs as SLS. Sure, given Orion's development cost I would say adding a hab/prop module to a commercial crew vehicle would have been the cheaper solution (or even a lunar taxi with propulsive capture). With SLS you're looking at >$2bn per year for 2 launches. Starting at the end of the next decade. Until it flies at that rate it is going to cost another ~$20bn. All that while FH comes "for free" and SEP costs a fraction and is needed anyway. If they actually use the SLS on this 'Journey to Mars' and launch a load of new robot spacecraft to the outer solar system on high-speed trajectories, then brilliant. The problem is that nobody believes that will happen. There has been little, if any interest in putting something on top of this rocket, as if everyone knows what is going to happen. As opposed (adjusting to match projected timeframe dollars for SLS) to flying eight FH's for $2bn per year? Or four Delta IV's? Or three Vulcans? And how in the world do you figure that FH comes "for free"?! FH right now is being guesstimated at a cost per launch between $120 million and $250 million, depending on who you listen to. Delta IV is already around a half billion per launch, Atlas V at around a quarter to a third of a billion, and I don't know anyone who is willing to bet that Vulcan will cost less than either of the other two ULA offerings available at present. This is, pardon me for saying so, one of the stupidest examples of going way overboard on "SLS will cost so much, it's completely absurd!" By trying to state that FH is "for free," you completely invalidate any argument you may have. Face it -- there ain't no big launchers that aren't relatively expensive right now. The difference between SpaceX and other providers is simply a matter of degree, at the moment. "For free" in this context means NASA doesn't have to pay for development or all the fixed cost. It is a rocket that will fly no matter what. I think FH plus SEP could approximately half the price per kg to cis-lunar space compared to SLS (assuming $200m for FH). Moreover it could save billions of development cost. That said, I am not a die-hard SLS opponent. Congress wants to pay for it, so be it. A 10m fairing can be moved by building it in three 120º parts. Assemble inside the vacuum test chamber. How to environmentally test a payload that needs a 10m fairing is a different but related problem. New extra large test chamber? Not only funded, but no defined long-term need. And by that I mean our political leadership has agreed to a goal that requires so much mass moved to space that a sustained need for an HLV is merited, and existing commercial capabilities cannot satisfy the goal. None of that thinking has taken place or been agreed to. No, the U.S. Government does not engage in that type of $B speculation without at least some sort of indication of demand, regardless how accurate or well done the study is. And moving mass to space is now a mature industry, with the private sector here in the U.S. the master of this capability, not the U.S. Government. So why does Congress want NASA to create a U.S. Government capability? If there is a real need, it should be easy to quantify. "The F-1 was originally developed by Rocketdyne to meet a 1955 U.S. Air Force requirement for a very large rocket engine." So there was need. And just to be clear, the military spends money differently than the civilian side of the government, so comparing the SLS to military rocket is apples-to-daisies. In the case of SLS/Orion, I will also point out that two of the major elements of future crewed BLEO missions -- SLS and Orion -- are in development at the same time, and targeted to come online at the same time. Well of course, they were created from the same source - the cancelled Constellation program. Which still doesn't address what they are to used for, especially since the Orion is limited to going to the Moon for 21 day missions - and that is not a critical path requirement for going to Mars (i.e. the supposed prime destination NASA is focused on). And there is funding now, this year, for early stages of DSH development. So, it's not even as if we're building a rocket that has no crewed elements under development. A Deep Space Habitat does not require an HLV. And bottom line, what many people see is that "stuff" is being built to justify the SLS, not to address critical path items that are keeping us from getting to Mars (or whatever is NASA's top priority). And if you have a capability that has to launch every 12 months (i.e. NASA's minimum safe flight cadence), then that means 70-130mT of "stuff" has to be in the funding pipeline years in advance. It take years, and sometimes over a decade, for NASA to build space "stuff", and here we are just 6 years away from the SLS being operational - and there is a lack of "stuff" in the funding pipeline. If the SLS truly was needed at this moment in history, you'd think we'd see more evidence of that need. Like a manned space program? We have that today without an HLV. There are NASA studies that show we could, if needed, go to Mars without an HLV - and studies that say an HLV would be an asset.